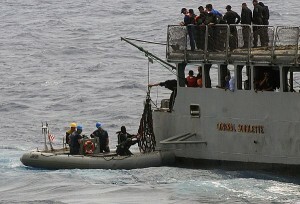 U.S. and Venezuelan Sailors work together during counter-drug operations in 2009. In the next few days there will undoubtedly be a glut of post-mortems on the Chávez era and predictions for the future (not least because much of Washington’s “blogging class” is home for a snowstorm)1. Much of it will be by experts on the region or those armed with interesting facts. I’m not aiming to compete or replicate their work; what I want to look at is the implications for defense cooperation, specifically naval and maritime matters. America’s tumultuous relationship with Venezuela under Chávez is well documented – from coups to theatrical UN speeches to declaiming Halloween’s frights as acts of “imperialist terror” – but it wasn’t always this way. Prior to Chávez’s inauguration in 1999, the U.S. enjoyed many fruitful defense ties with Venezuela including intelligence-sharing, counter-narcotics, military training, and defense exports. Most of these ties continued during Chávez’s first term in office, although an initial indication of Chávez’s wariness of the American military may have arisen during floods and mudslides in December 1999-January 2000. After allowing in roughly 100 U.S. troops, he cancelled plans for additional U.S. military construction corps members to assist in the recovery efforts. On the other hand, as late as 2002 Chávez still enjoyed interacting with the crews of visiting naval vessels, as this post by Chris Cavas, detailing a port call by the USS Yorktown (CG 48), and a declassified U.S. State Dept. Memo highlight. However, a mere 5 weeks later, the April 2002 coup would irreparably alter relations. The U.S. military came under particular criticism from Chávez, both for allegedly – and without proof – directly aiding the coup attempt and subsequent espionage and coup-plotting efforts. Venezuela expelled a string of military attachés on these grounds, a tradition continuing to this day (see below). Chávez also followed up his words by severing most of the existing military ties between 2003-2005, including ending training-support missions and participation in the annual UNITAS naval exercise. It may have been his calculation that there was greater value in showcasing an external “imperialist” threat to shore up support, in the tradition of Vladimir Putin, than to maintain ties with the U.S. But whatever the reason, military relations after the coup were quickly curtailed. In 2006, due to a lack of cooperation in anti-terrorism efforts, the U.S. followed suit by sanctioning arms exports to Venezuela. Despite these impediments, informal ties between the two militaries continued as the Venezuelan military backers of Chávez have reputedly been of a more pragmatic strain than their leftist civilian government counterparts. DOD allotted about $3 million for counternarcotics and related security assistance in Venezuela in fiscal years 2006 through 2011. Through 2009, this assistance was used in part to provide tactically actionable intelligence to both US and select Venezuelan law enforcement agencies. …allegations of high-level involvement by the Chávez government in drug trafficking. The U.S. has put seven top current and former Venezuelan officials on a Treasury blacklist for their alleged drug and arms dealing links to Colombian guerrillas based in Venezuela. Those links were exposed in 2008 after the Colombian military captured computers used by a guerrilla leader killed on a cross border raid in Ecuador. Among the officials put on the Treasury list are Gen. Henry Rangel Silva, the former minister of defense who was recently elected governor of the state of Trujillo. Mr. Rangel Silva and the others say they are innocent. Venezuela’s immediate future looks to be tumultuous and relations could in fact worsen. Vice President Nicholás Maduro moved to expel two American diplomats and claimed that Chávez had been poisoned with cancer by Venezuela’s “historical enemies.” This may have been mere posturing to aid power-consolidation for the immediate transition and new the elections that are constitutionally required to be held in 30 days – but it is a sign that things are far from certain to improve. Despite today’s focus on Chávez’s death, however, the more meaningful impact on U.S.-Venezuelan naval and maritime efforts may have come from last week’s enactment of Sequestration. As Sam Lagrone describes, the forced budget cuts have dealt a blow to Operation Martillo’s CD efforts, suspending deployments to SOUTHCOM of U.S. Navy frigates USS Rentz (FFG-46) and USS Thach (FFG-43). Just as an opening may occur for increased cooperation in the next few months or years, the U.S. may not be able to take full advantage of it.